These journals are no longer for sale, but the forms are still available to download so you can make your own. I created myself a yearly journal and I realized that I liked it so much that I wanted all of you to be able to have one as well. This book has a page for each week of the year to track your calories, exercise and how many healthy foods you’re eating. If you’re not spreadsheet savvy, you can buy this journal from Starling Fitness. The absolute coolest thing about it is you don’t have to wait until January 1st to use it. I will print it up with starting the month you specify, so you can use it immediately. 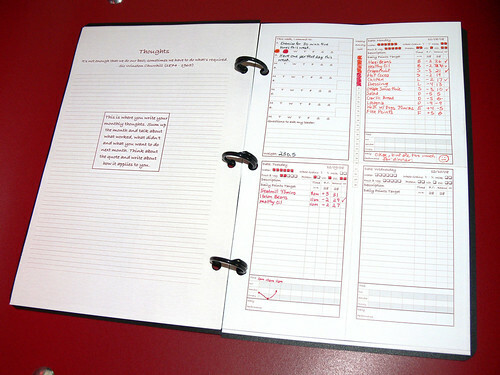 The journal is 3-Hole Punched for use with a Daytimer or other binder that takes 5 1/2″ X 8 1/2″ forms. Update 01-29-08: Here are some photos of the 3-Hole Punched Journal so you know what to expect. They also have the same non-descript black cover and are bound with three plastic rings that make it just as easy to remove the pages. 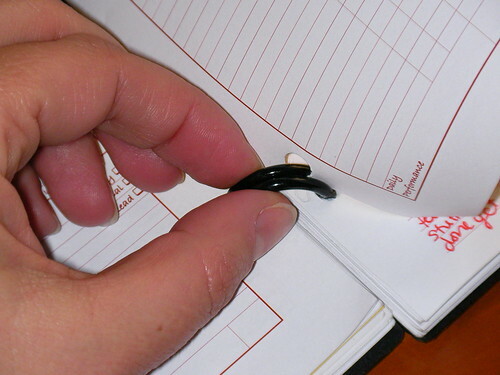 You can also remove the rings and put the pages into your Daytimer or other 3-hole binder. These journals are hand-made so they take a while to be made. I usually ship within two weeks of payment. Journals are shipped using the U.S. Postal Service and usually arrive within five days. 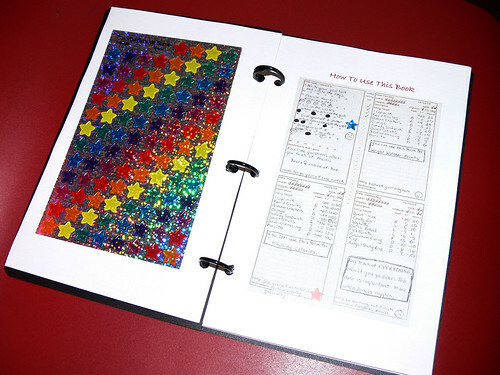 Update 12-09-08: The comb-binders are no longer available, but I am still selling the journals in the 3-Hole Punch version. The current journals are compatible with the Momentum Plan. I love it! Balls of steel for the photo…normally I would just use a flash! What a great idea, also designed by a user it has minimal redundancy and a ton of useful features and it’s actually usable; removing the page etc. Shipping is free in the U.S. If you really want a Starling Fitness Yearly Journal, tell me where you live and I’ll tell you how much it would cost to ship it to you. Where do you get cool self binding binders? Be great for my Son’s flash cards/ flash pages for school. I got them at Office Max. I haven’t been able to find them online. You do need a binding punch (which is about fifty bucks) to use them. Yes, after you click on the PayPal button, there is a shopping cart where you can choose the quantity. If you want them for Christmas, please hurry and order so I have enough time to get them to you before the holiday. One note of caution, however. Giving a weight loss journal might be considered an insult. If you’re giving them away to your friends who are already losing weight with you, that’s probably okay, but I wouldn’t recommend giving a gift like this to anyone who hasn’t expressed an interest in this kind of thing. hiya. This journal looks brilliant and i was interested in purchasing 1 of them as everything is in the same place and well organised, but noticed you don`t post outside the U.S. So we downloaded it instead and found that the pages dont look the same as in your pictures and your video. Any help would be greatly appreciated by me and my husband. You have to format the pages for your printer. Some printers can’t print as close to the edge as others. It takes a little Excel know-how, but with some trial and error, you should be able to print up your own sheets. Doh! if only I saw this before it was already April! If you order now, I will start it a week after I send it to you so you can start immediately. Could you tell me how much it would cost you to post one to Melbourne, Australia? Just ordered one of your journals and I can’t wait. How long do they typically take you to make? I just ordered mine under the wire….so I am anxiously awaiting! You made the monthly cut and I’m sending your journal out tomorrow morning! Hope you like it! Hello, Love the journal! I do have one question – what is the “FF” column for? Thanks! The FF column is for people following Weight Watchers. If what they are eating is a Filling Food, then they get a check mark for that food. Hi, Got my journal today and I love love LOVE it! Thanks a lot for getting it out to me so fast, and for the goodie 😉 This will help a great deal with my Weight watchers! You can use these journals if you are following the Weight Watchers Momentum program, but they are also useful for tracking calories, carbs or whatever else you have decided to track. You can download a sample page here: Starling Fitness Â» Weight Watchers Form. R u still selling the books? Can I pick one of these up somewhere? Looks great and I think I could benefit from this idea! Yes, I’m still selling the journals, but the shipping to Canada is really pricey for me. You can click on the link and fill out your information and it will tell you how much it costs to ship to Canada (I think it was about fifteen bucks). Please email a reply to my question regarding tips on how to calculate your points and add food items to the form. Having difficulty showing the correct remaining points left. It does not calculate them. Please help me by emailing me at vdruff@aol.com. I really need and appreciate this form. DO you have a sample form completed? Do you have any updates to this one? The form does not calculate your remaining points. I use this form with pen and paper, so I didn’t include any calculations, but you are welcome to alter it however you want. Are you still selling these journals? I’m sorry. I am no longer selling these journals.